Here's the first part of answers to some very FAQs about vintage perfumes: the myth, the obsession and the quest for oakmoss. You write a lot about old bottles and antique store finds. Aren't old perfumes a little icky? It's a matter of how you feel about vintage stuff in general. I love it. The husband and I spend quite a bit of our time antiquing and scouring stores for vintage furniture, art, housewares. I collect and wear vintage scarves and jewelry. Mid-Century Modern home decor goes exceptionally well with perfume from the same time period. Don't perfume go off after a couple of years? I read you're supposed to chuck and replace your perfume after a year, so how come you wear perfumes from the 70s and 80s? Some perfumes might turn, spoil, become rancid or whatever you want to call it, but these are the exceptions. Generally speaking, if stored away from light and in a stable coolish environment, perfumes are very likely to hold for decades. Sometimes the more volatile top notes become funky or disappear altogether (especially if there's citrus involved), but even then the heart and base are most likely intact. Perfumes do change over time, sometimes they deepen and become richer (just like wine), other times they lose their oomph. Two bottles of the same perfume can easily age differently, often due to small differences in the amount of air that got into the bottle. You can't predict it. I can tell you, though, that the oldest perfume in my collection was dated by an expert as pre-WWI. It's gorgeous and wearable. That one (or two) year myth is nothing short of a lie. Yes, I have heard about certain new perfumes that actually turned within that time frame. But don't throw out any bottle just because you were told to do so. Use your nose. What exactly is considered "vintage"? That's a good question. Many people I know refer to anything pre-reformulation as vintage. It drives me up the wall to hear an 80s, 90s and even 00s bottles being called vintage. My mom and I talked about it once as I lamented the 80s thing: if Eternity (1988), a perfume that came out the year I graduated high school is vintage, then what am I? An antique? My mother's answer was that it made her feel like a prehistoric relic. So, while I'd rather not define "vintage", let's agree to use more accurate terms such as "original formula" or "pre-reformulation". so, no, Britney Spears Fantasy is not a vintage perfume, ok? What are safe venues to find and buy vintage perfumes? Your very best bet is to scour dressers and closets in the houses of friends and family. It does not only help dating the bottle and its provenance, but also pretty much guarantees that the stuff is real. Your great-aunt Lottie is not very likely to tamper with the juice (unless she's one of the more infamous eBay crooks). Then there are yard sales, estate sales, consignment stores and antique stores and even the occasional flea market. Let's open this can of worms. Be very careful unless you know exactly what you're doing, what you're looking for and what you're looking at. I'm not even talking about scammers, which are plenty, but simply about making rookie mistakes, overpaying and having some very expensive disappointments. Every eBay purchase is a risk. You have no way of telling if the item is authentic, if the juice inside is the real thing and if it's fresh. Buying a sealed box doesn't guarantee much. The perfume inside might have evaporated to almost nothing (leaks can often be spotted on the box, unless it's paper-wrapped), the stopper might have fallen off or even be broken. When the box and bottle are not sealed there's the risk of tampering. And does the seller know for sure the item is not actually a factice (a demonstration bottle full with colored water)? Sometime there's a label on the bottom, but it might have fallen off. So, yes, eBay can be a great source, even in today's prices, but you'd better do your homework regarding the particular perfume, bottle shape, color of the juice and the seller's reputation. This was part 1 of (probably) 3. The next installments will discuss such questions as why even bother, what is worth the risk and effort and a lot more. Please feel free to ask more questions in the comment section. They'll be added to the next Ask The Non-Blonde: Vintage Perfume posts. 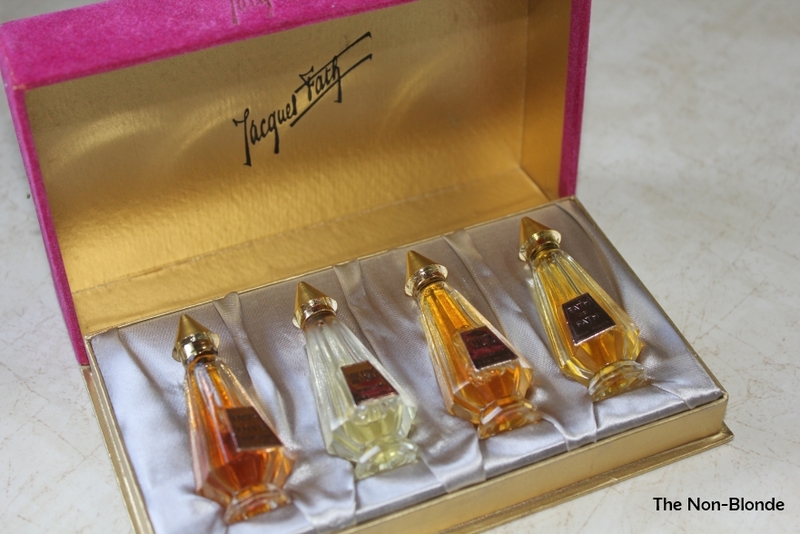 Photo of a Jacques Fath coffret from my personal collection. Good advice. I just finished a two-month ebay adventure, mostly successfully. I sometimes think we vintage fume-heads are like the birders in "The Big Year"—we get caught up in the chase. There's some tulipmania at work , too. I'm a Weil fan, ever since discovering Weil de Weil in the late 70s, then finding out my favorite fragrance, Mollie Parnis was a Weil, too. I began a mad pursuit, Zibeline, Antilope, even the elusive Chunga. Never mind the Secret de Venus oils going for north of $300, at least I had a limit and stuck to it. A little Zibeline and a lot of Antilope later, I find, yes, they're lovely, but so is the much more accessible My Sin, to which they bear a powerful resemblance. Indeed, aldehydic florals of a certain age have a depth that seems beyond recapturing. Myself, I find I curate these as experiences rather than–how shall I say?—wardrobe additions. When they're gone, they're gone, and I'll be happy to have smelled them; since smell is the most evocative sense, what I've experienced is history itself, unbottled. Loved the article, since I do collect vintage perfumes. My favorite is Pretexte Perfume(as you know)and then (of course) Evening in Paris,the orginal set was my Mom's from 1945!!! Looking forward to reading more on the subject. Thank you! Excellent myth-busting post. I rely on serendipity for my vintage or "retro finds" (ie 60s, 70s, 80s, even 90s) -- mostly running across the occasional item in a thrift store when I'm looking for a scarf or bracelet. Looking forward to the next parts on this subject. Great post! I so wish I would have kept some of my mom's Guerlain perfumes that she gave to me when I was a kid in the 70's. does that jacque fath collection mean you have an Iris Gris? Where on earth did you get that and will you leave it to me in your will? Excellent post. Looking forward to the next 2. I am one of those people who stupidly fell for the myth about perfumes going bad after a few years. So I gave away some perfumes that I now miss; and since I started looking to replace them, I've been finding out that they are all rare (limited editions, never sold in the U.S., etc.) Aargh.